350 le chiffre magique ? 350 ppm pour être précis ! Les “ppm” ne servent pas à mesurer la vitesse de la musique, mais la concentration maximale de particules de CO2 par millions. Si on veut éviter que l’air terrestre ne subisse un réchauffement, ce taux de ppm doit être de 350. D’après des organisations environnementales, aujourd’hui on a atteint les 390 ppm ! Alors action ! C’était le mot d’ordre ce 24 octobre dans 180 pays. Aux Philippines, au Kazakhstan, en Mongolie, en haut du Kilimanjaro en Tanzanie, à Shangaï etc. “350″ est devenu le symbole de la lutte contre le réchauffement. Pour ne pas passer une année de plus à 390 ppm! L’opportunité d’imposer des changements au sommet de Copenhague en décembre doit êre saisie. Les organisateurs de 350.org, liés à la campagne “tck tck tck” d’urgence climatique, veulent faire pression sur les dirigeants à travers ces mobilisations qui touchent presque toute la planète. Much of the cheap meat and dairy produce sold in supermarkets across Europe is arriving as a result of serious human rights abuses and environmental damage in one of Latin America’s most impoverished countries, according to a new film launched in conjunction with the Ecologist Film Unit. An investigation in Paraguay has discovered that vast plantations of soy, principally grown for use in intensively-farmed animal feed, are responsible for a catalogue of social and ecological problems, including the forced eviction of rural communities, landlessness, poverty, excessive use of pesticides, deforestation and rising food insecurity. The film, Killing Fields: the battle to feed factory farms – produced by a coalition of pressure groups including Friends of the Earth, Food and Water Watch and with European coordination by Via Campesina, – documents the experiences of some of those caught up in Paraguay’s growing conflict over soy farming and reveals, for the first time, how intensive animal farming across the EU, including the UK, is fuelling the problem. It looked – at first – eerily like a routine news event. A man in a nondescript dark suit standing at a podium in one of the smaller meeting rooms on the 13th floor of the National Press Club. But then suddenly it wasn’t. “There is only one way to do business and that is to pass a climate bill quickly so this December President Obama can go to Copenhagen and negotiate with a strong position,” said the speaker – who said he represented the US Chamber of Commerce. The statement represented a complete repudiation of the Chamber’s earlier opposition to climate change legislation. The hard line had triggered walk-outs from Apple and a handful of other high-profile companies in the past few weeks. The companies are trying to press the business organisation to support the bill by the senators John Kerry and Barbara Boxer that is to be debated by the Senate next week. Or maybe not. Barely 20 minutes into the Q&A section of the press conference, an agitated spokesman for the Chamber burst into the room, screaming that the event was a hoax. The spoof got under way with a press release inviting journalists to a morning news conference. Most reporters overlooked the misspelling of the Chamber president’s name. He went out even further on a limb when he called clean coal “a hoax”, saying the money would be better spent on solar energy research. “Clean technology has not only not been proven. It basically doesn’t exist,” he said. It was about that time, the real Chamber spokesman burst into the room – and had a mild shoving match at the podium. “What happened today was a fraud and I believe illegal,” Eric Wohlschlegel said. The spokesman said he learned of the hoax when a reporter came to the Chamber office looking for the press conference. Wohlschlegel said he immediately leaped into a taxi. The spoof appears to be the work of the Avaaz Action Factory, which put a post on its website promising to “make this the worst Monday ever for the anti-climate PR machine at the US chamber of commerce”. And while a number of reporters still pressed Wohlschlegel for signs of a shift in the Chamber’s position, he soon set them straight. The Chamber was as opposed to climate change legislation as ever. Many people believe England’s westernmost point to be Land’s End. The clue’s in the name. But travel 28 miles west of Land’s End and you hit – as many sailors have literally done over the centuries – the sublimely beautiful Isles of Scilly, which boasts the UK’s southernmost point and is also one of the world’s premier sites for wreck diving. The honour of westernmost point goes to Rockall, an uninhabited islet far out in the Atlantic Ocean, although it’s best not to go on about it too much as Iceland, Ireland and Denmark lay claim to it too. 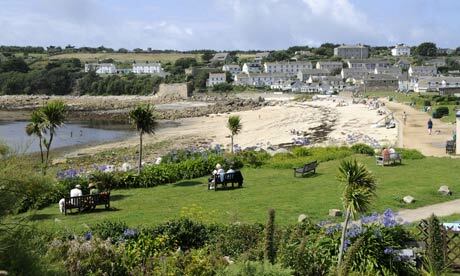 The Isles of Scilly’s relative isolation and microclimate makes them a wonderful holiday destination, but their distance from the mainland also affords them the chance to take part in an interesting experiment. Tomorrow, the islanders – some 2,000 people – will conduct, according to the organisers, the “first coordinated attempt by a community to reduce their electricity use and to have the effects of their efforts measured in real-time”. The event is being called E-day 2009 and it is the culmination of the Isles of Scilly Earth summit, which took place over the weekend and saw “international, national, and local islanders talk about the impact of climate change and human activity on their island”. E-day will involve everyone on the Isles of Scilly being asked to switch off electrical items which do not need to be on, so that collective energy saving can be measured. The energy savings achieved by a family, the school and the community on the Isles of Scilly will be compared with the baseline conditions simultaneously experienced across the UK. The fact that a single cable carries electricity to the Scillys from the mainline makes it all the easier to measure the energy used on the islands over the course of the day – something that the E-Day organisers admitted was a struggle to achieve during last year’s event in which they tried to measure the energy use reduction across the whole of the UK on a particularly cold February day. E-Day 2008 did not succeed in cutting the UK’s electricity demand. The drop in temperature between Wednesday 27 February and Thursday 28 February probably caused this, as a result of more lights and heating being left on than was originally predicted. The National Grid refined its assessments, based on actual weather data, during Thursday afternoon but I am afraid that E-day did not achieve the scale of public awareness or participation needed to have a measurable effect. I will do my best to learn the relevant lessons for next time. The hope is that this year’s event will be a success with its focused, localised approach and, crucially, the support of the island community. Dr Prescott will be posting a blog about how the day went on environmentguardian.co.uk later this week, but if you’re a Scillonian please do tell us what you’ve got planned for the day. More widely, let us know what you think about E-day, Earth Hour and similar campaigns: do they help to raise awareness about energy-saving measures?